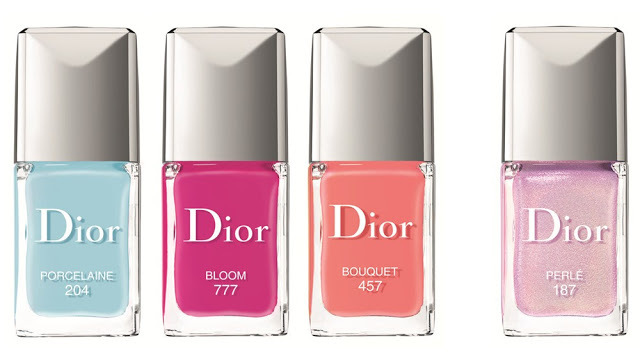 Coming in January 2014, the new spring make up collection by Dior. Online you can already find a lot of news and photographs of this collection, that promises to be the perfect combination of modernity with tradition. Dior decided to be inspired by Versailles and the great festivals (the Trianon) that Marie Antoinette organized for the French nobility. If you have in mind the colors and atmosphere of Marie Antoinette, Sofia Coppola’s film, then you know what I’m talking about: a riot of pink, turquoise, fuchsia and the feeling of being in a flowery meadow or in a candy store. This wants to be the feeling of those who, in perfumery, will bump into the collection Dior Make Up Spring 2014. Not surprisingly, the choice of tone for the nail varnishes is more than clear: Porcelaine is a very light baby blue, and Bloom and Bouquet are fuchsia and coral and light pink pearlescent Perlè is that we will judge only when we can see it in perfumery. It seems to me in any case a very special collection and certainly very fragrant spring and lightness. Maybe a little too classic and certainly more suitable for a younger audience, but at the same time probably the most original and varied than what we could see in the house Chanel for example. We’ll see how it will be received by fans of the brand in perfumery. We’ll have to wait until mid-January anyhow.